The idea of living on the moon captures the imagination. Even before the first human set foot on the lunar surface during NASA's Apollo program in 1969, people around the world were dreaming about a permanent moon base to colonize Earth's closest celestial object. Some scientists think humans could survive comfortably on the moon. In some ways, the very minimal gravity of the moon might actually be more conducive to life than the microgravity astronauts experience on the International Space Station. Although it hasn't been formally tested, some experts hypothesize that the small amount of gravitational force put on an astronaut's body when on the moon could help stem some of the adverse effects like bone-density and muscle loss that spaceflyers experience while living in microgravity on the International Space Station. This could make colonizing the moon an even more appealing option. "I have thought that the initial return to the moon would consist of what I call a 'human-tended outpost,' where people go there for extended tourism time — there's no permanent residence except in the sense of rotating crews," Spudis told SPACE.com. Just like the International Space Station, Spudis' concept of the lunar base would require crews of four to eight people to rotate in and out of the base. 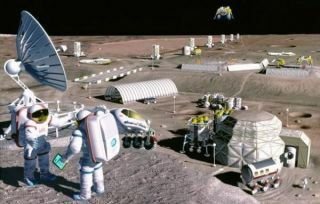 A European Space Agency (ESA) study found that 3D printing a lunar base using material already available on the moon could be a practical way to establish an outpost on Earth's nearest cosmic neighbor. Under the ESA's hypothetical plan, a robotic mission to the moon could do most of the work before astronauts ever needed to set foot on the lunar surface. A robot would conduct the 3D-printing program autonomously. The robot would use a mixture of lunar dirt and dust, called regolith, to cover an inflatable dome with layers of the robust material. "It's a dream from a manufacturing point of view," said Tommaso Ghidini, head of the ESA's Materials Technology Section. "You just have your house being printed around you." By using the moon's indigenous material, space agencies can save money on the cost of flying pricey missions to and from the moon's surface. Astronauts would be sent up to man and maintain the station after the habitat is at least partially built. Once on the moon, instead of having to stage costly missions aimed at delivering oxygen and other necessary volatiles from Earth, experts might be able to actually use mined lunar material to manufacture gasses needed to sustain life on the satellite. "The consumables of air and water would largely be drawn from local resources," Spudis said. "They would not be imported from the Earth, but everything else would be. So, all of your high-tech equipment, all of your food, any kind of specialized needs — clothing, things like that — for the inhabitants would be brought from Earth." Water could also be used for radiation protection on the exposed lunar surface, Spudis added. The moon has no atmosphere, so people would be completely susceptible to the radiation that would bombard the rocky satellite every day. Water manufactured on the moon could help shield lunar lifers from those effects. Eventually, a base on the moon could lead to human exploration in deeper parts of the solar system, Spudis said. By developing vehicles and space transportation systems that can enter and remain in the area between the Earth and the moon (called cislunar space), scientists can use that in-between space as a staging and fueling ground for a mission to Mars. If missions were to begin to move into deep space, they would need to be self-contained, said Marco Caporicci, special adviser to the director of the ESA's Human Space Flight Operations for Transportation and Exploration. The moon base could function as a good proxy for these kinds of missions by monitoring how an autonomous habitat on another celestial body functions. Spudis thinks engineers might be able to manufacture propellant for deep-space travel using the natural resources the moon has to offer. When the propellant is created, it can be sent to cislunar space to help fuel spaceships ready to depart for other areas of the solar system and beyond.